I was wondering if anyone could me with an issue I've been having for a little while. I seem to have issues with video streams freezing on playback. The client is still completely responsive but the only way to resume the video is to back out of it and resume. The server I'm using shouldn't have any issues with transcoding either because it's an eight core Xeon processor with hyper-threading. Any ideas? Edited by nharmon, 29 May 2018 - 10:58 AM. is it doing any transcoding? what is the content/bitrate? have you tried to change the bitrate in the app? It seems to happen on all the content of my server regardless of bitrate. The only times I've noticed it freezing is when it's transcoding and, depending on what device you're using, changing the quality lower or higher resumes the video stream as well. Edited by nharmon, 29 May 2018 - 01:15 PM. Anyone have any ideas as to what may be causing this? What emby app are you playing with? I've personally seen the issue occur on the web app, Chromecast, and Android app. Should I attempt a clean installation of my server? Would this possibly fix the issue I'm having? If it's transcoding then attach the transcode log Are you using hardware acceleration? If so, try disabling it and trying again. Yes those are good questions, thanks. I just played a video on my Android phone and it ended up not transcoding at all, however, it did stop playing about seven minutes in. From the server logs I'm not seeing anything abnormal. The last line just says the app reported the video stopped playing. Edited by Happy2Play, 01 June 2018 - 03:22 PM. This a short snippet from yesterday that did transcode and reportedly stop playing. I attached the transcode log as well. Edited by Happy2Play, 01 June 2018 - 03:24 PM. That was just a remux and wouldn't cause a freeze. What's your network setup? Also, gonna need to attach the full log of for post #10. Should probably enable debug and send a report from your Android device when it happens again and post back here with user name and time it occurred. Edited by Happy2Play, 01 June 2018 - 03:25 PM. I attached the full log from #10. The server has a gigabit connection but my external network speed is 100/100. With the remux from yesterday the client was playing the video off of a mobile data connection. The client device on the snippet from post #10 was on the local network of the server. Edited by nharmon, 03 June 2018 - 03:10 PM. Because this issue seems to take place regardless of the client device I'm assuming it's an issue with the server. The possibility of a network issue comes to mind but I find that hard to believe because the issue happens when I'm on the LAN network of the server. For external users clients use a domain that's linked to my external IP address and port forwarded thru port 8096 to the server computer. Also, I'd like to mention that changing the video quality instantly resumes the video. Is it possible that I'm having a memory issue? Just because it's on your LAN doesn't necessarily negate a network issue. Have you perf tested your network, iperf or otherwise? What's the output pinging your box from a client on your LAN? What does htop look like when you're streaming/freezing? How are you connecting to the server? Do you have a reverse proxy set up? Where does you media live? Does this happen when you try to use an external player? The more info you can supply, the better. Could be a meriad of possible bottlenecks. Edited by mastrmind11, 03 June 2018 - 02:36 PM. Thank you for the help you've provided me with so far. I attached images of some network tests below. I also do not have a reverse proxy set up and the media resides on an internal zfs pool setup with striped mirrored vdev's of 4TB hard drives for a total usable capacity of 16TB. I'll have to get back to you on the external player part. I'll test it now and see if I have any issues. great info, well done. 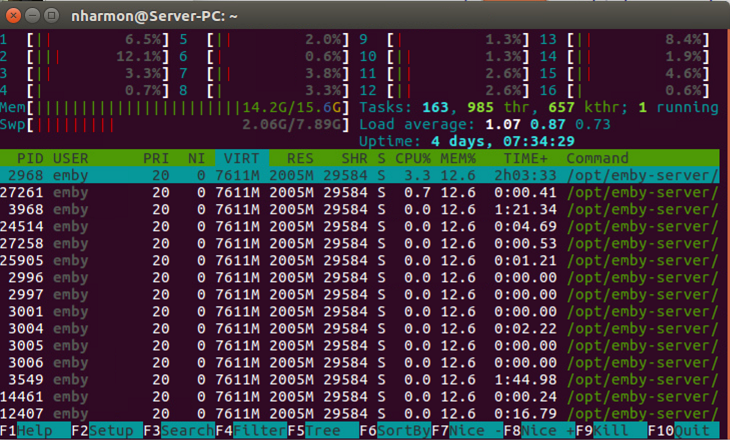 but wait, is that htop from when your server is activly streaming something? if not, i'd like to see one of those. Edited by mastrmind11, 03 June 2018 - 03:20 PM. Nope no compression. They are "literally local" HDDs. I will admit when I originally dove into making this server I didn't know much about Linux.... I've learned a lot since then. Also no, there's no compression being used. 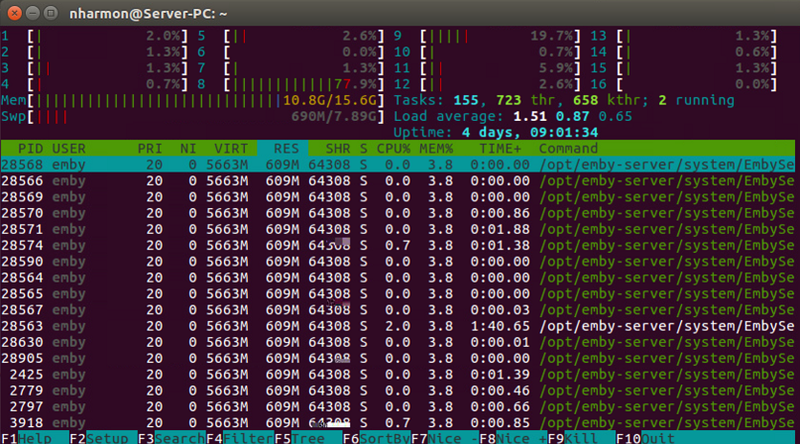 As for the htop screenshot, that image was taken during a direct stream that was freezing. The following screen grab was taken while transcoding at 1080p and 60 mbits but the video stream has not frozen yet. Edited by nharmon, 03 June 2018 - 03:27 PM. that's truly bizarre. one thing that sticks out, and likely unrelated, wtf is taking up 10gb of memory on your box? Emby is 500MB on its worst day. if you say this is the behavior for every media you play, I'm at a loss. Your network is healthy, your server (minus the RAM q above) is healthy, your HDDs are local, your CPU is more than capable of trancoding. I guess last question is do you see this behavior regardless of client? If no, which clients are being jerks?